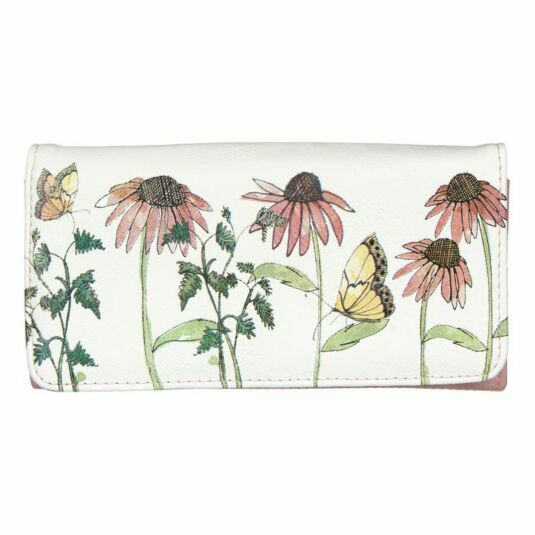 This fresh and summery wallet from Disaster Designs features a row of pale pink flowers and green foliage with pale yellow butterflies flitting among them. The colours are soft and subtle, with the quirky drawings outlined in black on a pale cream background. 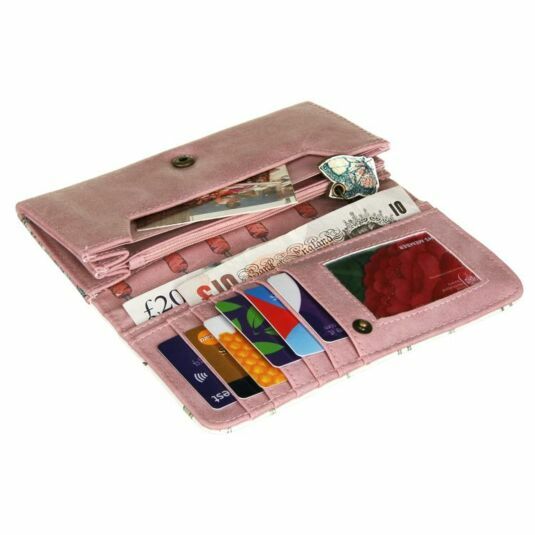 The wallet is made of realistic faux leather, with a soft feel and textured surface. The background colour of the whole item is a lovely shade of dusky pink, with a slightly mottled tone. 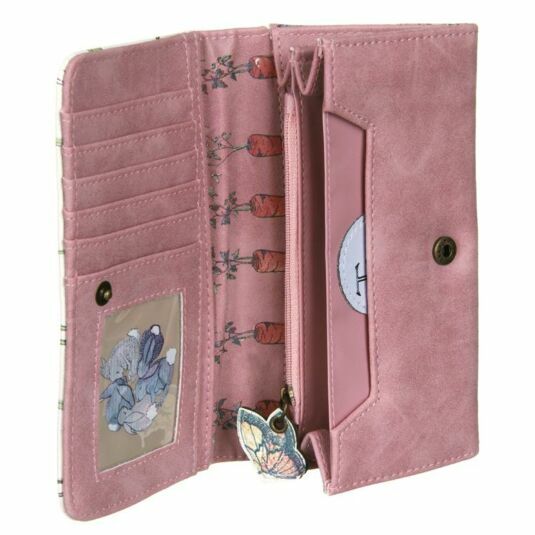 The wallet opens to reveal a cute illustration of sleeping bunnies, in a circle with heads resting on each other, behind the plastic photo card window. The rabbit fur is in shades of grey, and the white fluffy tails stand out against an earthy background. A row of carrots are depicted against the inner spine of the wallet in lovely detail. There are five slots for credit cards with two long pockets behind them and four further long pockets on the opposite side for paper money and receipts, one of which is zipped to hold small change. 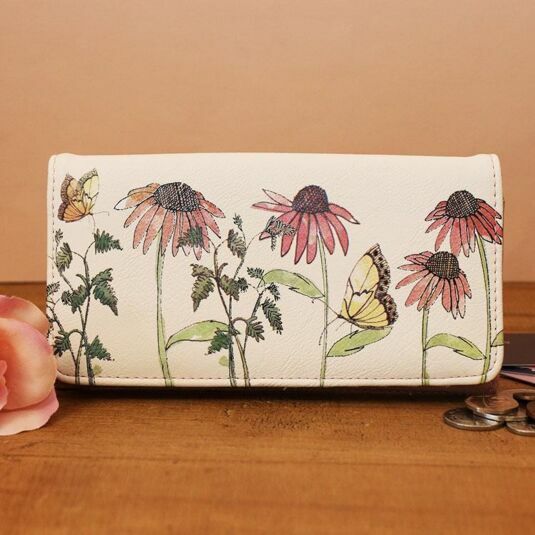 The zip pull itself is a lovely detail of a butterfly printed onto cut out faux leather. The interior pockets are all lined with water resistant matching green fabric, and the Tales and Trails logo is sewn into the first pocket. The interior is held securely closed by a press stud in copper tone metal. 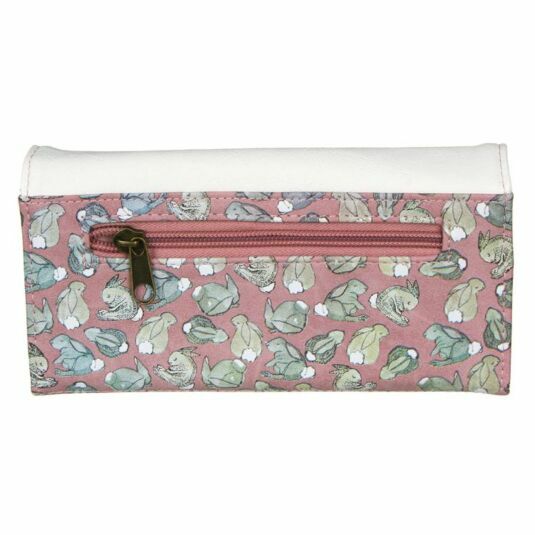 The sleeping bunny imagery continues on the back of the wallet, where the curled up rabbits form a delightful pattern of grey sleeping shapes against the soft pink background. A final zipped pocket completes the practical elements of this piece. 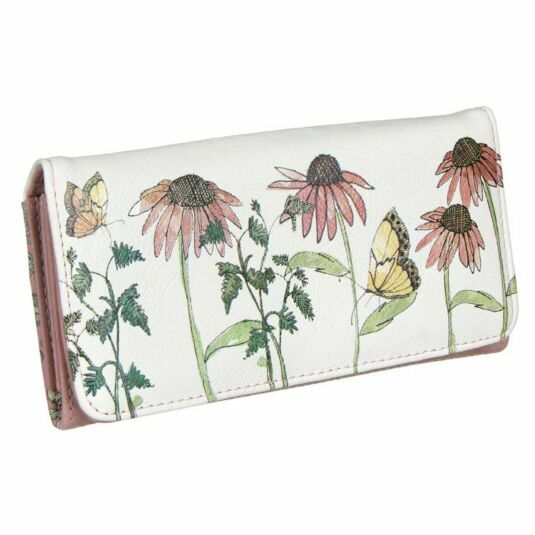 This lovely wallet would make a welcome gift for lovers of nature and wildlife, or even an inspired gift for Easter, including teenagers, mothers and grandmothers.